What? Connection reset by peer? 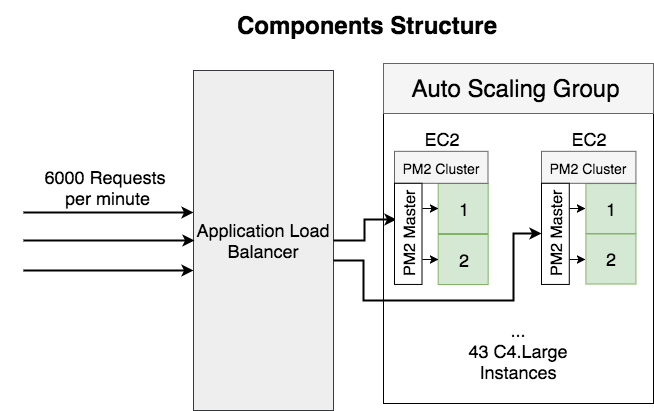 We are running Node.js web services behind AWS Classic Load Balancer. I noticed that many 502 errors after I migrate AWS Classic Load Balancer to Application Load Balancer. 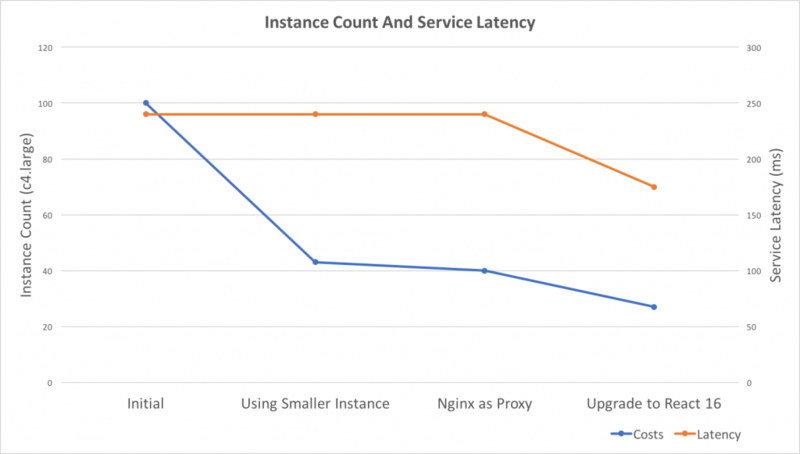 In order to understand what happened, I added Nginx in front of the Node.js web server, and then found that there are more than 100 ‘connection reset’ errors everyday in Nginx logs. 2017/11/12 06:11:15 [error] 7#7: *2904 recv() failed (104: Connection reset by peer) while reading response header from upstream, client: 172.18.0.1, server: localhost, request: "GET /_healthcheck HTTP/1.1", upstream: "http://172.18.0.2:8000/_healthcheck", host: "localhost"
2017/11/12 06:11:27 [error] 7#7: *2950 recv() failed (104: Connection reset by peer) while reading response header from upstream, client: 172.18.0.1, server: localhost, request: "GET /_healthcheck HTTP/1.1", upstream: "http://172.18.0.2:8000/_healthcheck", host: "localhost"
2017/11/12 06:11:31 [error] 7#7: *2962 upstream prematurely closed connection while reading response header from upstream, client: 172.18.0.1, server: localhost, request: "GET /_healthcheck HTTP/1.1", upstream: "http://172.18.0.2:8000/_healthcheck", host: "localhost"
2017/11/12 06:11:44 [error] 7#7: *3005 recv() failed (104: Connection reset by peer) while reading response header from upstream, client: 172.18.0.1, server: localhost, request: "GET /_healthcheck HTTP/1.1", upstream: "http://172.18.0.2:8000/_healthcheck", host: "localhost"
2017/11/12 06:11:47 [error] 7#7: *3012 recv() failed (104: Connection reset by peer) while reading response header from upstream, client: 172.18.0.1, server: localhost, request: "GET /_healthcheck HTTP/1.1", upstream: "http://172.18.0.2:8000/_healthcheck", host: "localhost"
The number of errors was increased after I migrate Classic LB to Application LB, and one of the differences between them is Classic LB is using pre-connected connections, and Application LB only using Http/1.1 Keep-Alive feature. The load balancer received a TCP RST from the target when attempting to establish a connection. The target closed the connection with a TCP RST or a TCP FIN while the load balancer had an outstanding request to the target. The target response is malformed or contains HTTP headers that are not valid. I’m working on a project which needs to fetch messages from hundreds of SQS queues. We’re using SQS long polling to reduce the number of empty responses. It was very quick to get response at first when there are only dozen queues. As we added more and more queues, the performance getting worse and worse. It takes 60 seconds to get the response when there’s 300 queues and WaitTimeSeconds set to 10 seconds. We are using Node.js in single thread mode, and I believe that it could handle 10 thousands connections without any problem because most of the tasks are IO processing. We also created an AWS support case, but nobody clearly answered the question. Many open source books are written in asciidoc, in order to read the book in kindle, I have to convert it to mobi file. Here’s a quick note on how to convert files. The git branches in local repository will grow rapidly if you are using branch development, e.g. always create a new branch for any new feature/story/bug-fix. The branch becomes useless after it merged to master, here’s some commands to clean up branches in local repository.